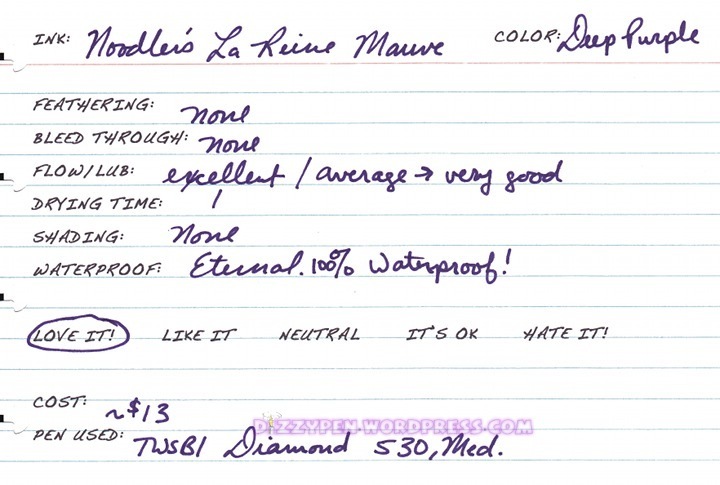 Noodler’s La Reine Mauve, what a fantastic purple ink! I love this color. I have no idea what took me so long to buy a bottle of it. LRM is a rich, deep, dark purple, and it’s waterproof to boot! What more can a purple lover like me ask for? I’ve been using it everyday for over a month now, and I’m still just as in love with it as I was when I first got it. I highly recommend this ink. It is a win for Noodler’s I assure you. This ink is quite well behaved. Like all other Noodler’s Eternal/Bulletproof/Warden’s ink lines it will require a little higher maintenance, but nothing beyond an extra rinse here and there. It is quite fast drying, and it can be a hard starter if you leave your pen uncapped. Still, I haven’t had much trouble getting the ink flowing again. It just takes a couple strokes and I’m back in business. Now, one of the things I really don’t like about this ink is the price. It is about $13 for only 1 ounce of ink. Noodler’s regular like runs about $12 for 3 times as much ink. No feathering or bleeding on good quality paper. Can bleed a little on light weight/poor quality papers. Completely waterproof. This is a Noodler’s eternal ink. This ink has a strong chemical smell to it. If you use Noodler’s inks you are very familiar with the smell. Finally, I do experience a bit of line bloat with this ink (same with its cousins Fox Red and Hunter Green). I agree, what a lovely color! I can’t say I’ve seen it before. Do you have a feel for how it compares to something like C d’A Storm, or J. Herbin Poussiere de Lune? It’s much more saturated than those two, and it’s waterproof. It’s more on the blue side of purple. Think royal purple. How does it compare with Violet Vote (Iraqui Indigio), which is also supposed to be eternal, and is $18.50 for 3oz. Less bright I think, from the pics on the web. LRM is less bright and much darker. Does this color stain the twsbi? I haven’t had any problems with it.